From a hill on an island overlooking scenic Narragansett Bay, the United States Naval War College Museum boasts a view like no other. It also boasts a history like no other. Formerly the Newport Asylum for the Poor, which was renovated as the original home of the Naval War College, the museum occupies Founders Hall, a National Historic Landmark. It was here that Captain Alfred Thayer Mahan first delivered his lectures on sea power, which were subsequently collected and published in 1890 as the epochal The Influence of Sea Power upon History, 1660-1783. Above: George Eisenberg and granddaughter Margot Janson at the Naval War College Museum opening, 22 February 2012. 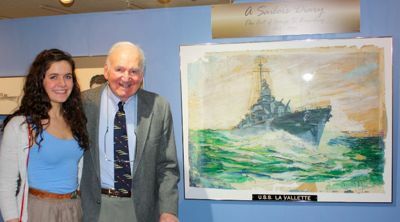 Below: USS La Vallette, on display through 1 July 2012. Courtesy, Julie Janson and A Sailor’s Diary. The museum’s themes are the history of naval warfare, particularly as studied at the College, and the naval heritage of Narragansett Bay—a tale that begins with the nation’s colonial roots. Its collection consists of items relating to these subjects that are perceived to be of value to scholarship, and it forms the core for exhibits throughout the College and for educational outreach projects. Besides permanent exhibits on the College, the genesis of the Navy in the region, and the evolution of permanent naval installations from the late nineteenth century to the present, the museum features short-term special exhibits relating to College curriculum and to current naval-related topics. 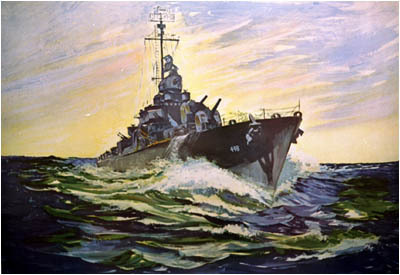 In general, Museum exhibits identify milestones in the evolutionary development of war at sea; explain the significance of the sea as a factor in the formulation and the attainment of national policy objectives; describe the character, educational philosophy, and mission of the College; and chronicle the eventful relationship of the U.S. Navy with Narragansett Bay and its people. While the museum is primarily for the education and the edification of the Naval War College community, it also provides the “corporate memory” of the Navy in the region and serves as a clearinghouse for naval history information in New England. Its director, a subject matter specialist and staff answer inquiries and provide guidance and orientation talks to visitors on regional naval history and current exhibits. They also assist scholarly researchers in the use of the museum holdings. Visitors may also access the U.S. Navy 20th Century Ships History Database from a kiosk at the museum. The Museum is open to the public 10 a.m.–4:30 p.m., Mondays through Fridays throughout the year, and 12 noon–4:30 p.m. on weekends during June through September. It is closed on holidays. Public access to the Museum with personal vehicle is through Gate 1 of U.S. Naval Station, Newport. Tours and school buses enter through Gate 10 of the Naval Station. For reservations please call 401-841-4052 at least one working day in advance. Reservations and photo identification are necessary for entry onto the Naval Station. Visitors must stop at the Pass Office before proceeding to Gate 1. Facilities for the handicapped are available, as is a gift shop operated by the Naval War College Foundation (which partially funds Museum operations). Further information on exhibits and special events is available by writing to: Director, Naval War College Museum, Naval War College, 686 Cushing Road, Newport, RI 02841-1207, or telephone (401) 841-4052/2101 (DSN 841-4052/2101). Fax (401) 841-7074 or e-mail: museum@usnwc.edu.